A – How do I get to the post office? 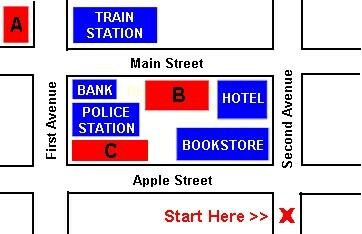 B – Go past the hotel and turn left onto Main Street. Go one block and turn right. It's across from the train station. A – How do I get to the supermarket? B – It's easy. Turn left at the corner onto Apple Street. Go one block. The supermarket is on the corner of First Avenue and Apple Street, next to the police station. A - Excuse me. How do I get to the restaurant? B – Go straight past the bookstore and the hotel. Turn left onto Main Street. It's the second building on the left, between the hotel and the bank. 1. get How to restaurant do I the ? 2. straight bookstore past Go the . 3. left at Street corner onto Apple Turn the . 4. across It's station from train the . 5. Main Turn onto left Street .